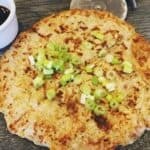 Kimchi Pancakes are light, spicy pancakes made from Kimchi and Rice Flour. Oil-Free and Gluten-free, this flavorful pancake is a wonderful appetizer, side dish or main entree. Measure 1 cup of drained Kimchi. Reserve fluid, so make sure to strain it. Place kimchi in a mini chopper or chop small by hand (I used a food processor and pulsed until small). Put chopped kimchi in a mixing bowl. Put chopped, drained kimchi in a bowl. Add 1/2 cup rice flour and garlic to kimchi in the bowl. Pour 3/4 cup kimchi juice/fluid reserved into the bowl. Pre-heat pan on medium high. It is important the pan is hot BEFORE you put the kimchi pancake batter in the pan. Pour batter into the medium high heated pan. Spread to make evenly distributed. Cook for 8-10 minutes on each side, checking the pancake often with a spatula. When it is time to flip the pancake, I used a large round plastic plate. I flipped the pancake onto the plastic plate and then returned it to the pan on the opposite side. Cook the opposite side for 8-10 minutes, until brown and cooked on both sides. Using a pizza cutter, cut it into equal sections.